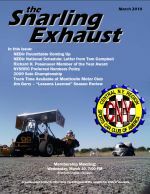 The Snarling Exhaust is the official newsletter of the CNY Region of the SCCA. It focuses on covering any of the region's activities, but also occasionally branches out to cover other automotive events in the area. All issues are available for download below, or via email subscription. To subscribe to the email mailing list, contact our webmaster.